Ma & Pa Kettle - The Works of Joe Campolo Jr. 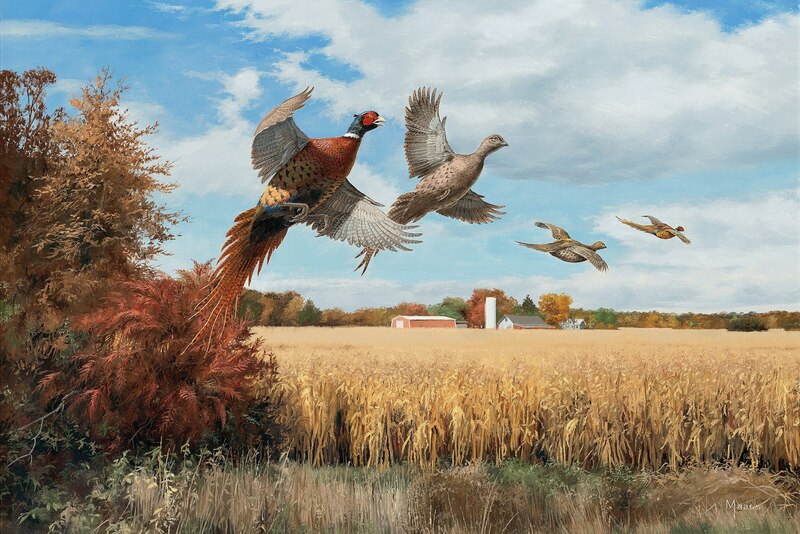 Whenever autumn arrives my thoughts turn to pheasant hunting; one of my favorite activities throughout the years. 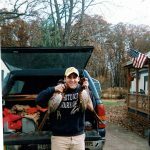 My best friend Jim and I hunted and fished together for many years, until he passed away unexpectedly two years ago. Over the years we had many fine adventures in the woods and water. We started hunting in the “Teapot Woods” in Kenosha, Wisconsin when we were just sprouts in grade school. The Teapot was within easy riding distance of our bicycles; and reasonable walking distance as well. The Teapot was adjacent to Vern Irons farm, and when wild game enticed us to cross over onto Vern’s farm, we harbored no ill will when he chased us out with his shotgun; it was somewhat of a ritual. As time passed, we fished all over Wisconsin including Lake Michigan for perch and smelt, the Mississippi River for Walleye and catfish….and all points in between. As we grew older we expanded our hunting and fishing territory to include much of the Midwest; and we graced Northern Ontario in Canada with our presence as well. Now Jim and I were not what you would refer to as the consummate sportsmen. We didn’t much care if our tackle box was a wreck; untangling lures might be considered a sport in some places; you never know. And if our shotgun had a bent stock; why we just bent along with it while shooting. We would never win any trap shooting patches, or fly tying trophies either for that matter. We didn’t always get up at the crack of dawn, although we often went to bed around that time. And we didn’t always brush after each meal or clean our guns after each use…. but I doubt few people had a better time at it than we did. 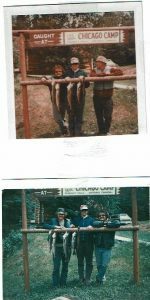 Jim’s parents had a small cottage in central Wisconsin and we had many fine days fishing and hunting up there over the years. When we were of age to drive and had the run of the place, all bets were off! Any number of adventures and “miss-adventures” took place. One of our favorite haunts was a nearby nightclub for young people. Jim was convinced that the musk sold to attract bucks in the fall, would also attract young girls at the club; however the scent apparently had the opposite effect on them. (Sometimes creating an awkward scene requiring a hasty retreat) No matter, we danced to our own drummer and enjoyed the hell out of ourselves! 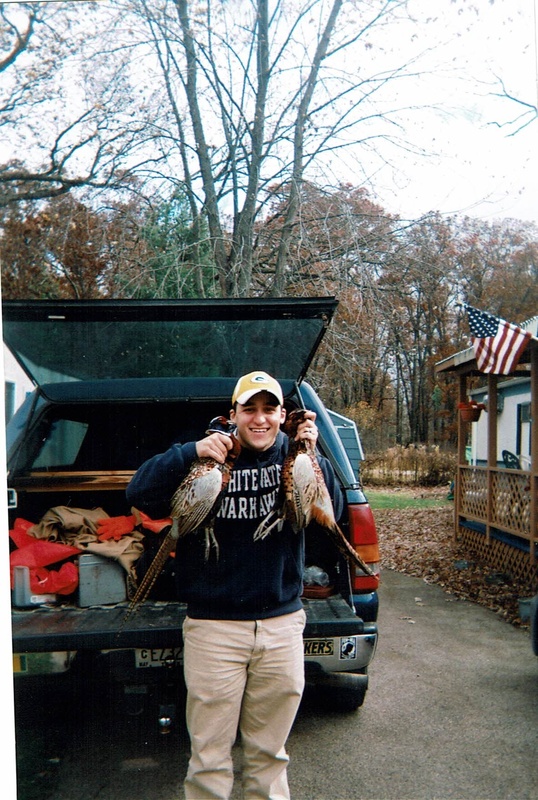 Of all the hunting trips we had, hunting pheasants and rabbits on the farm owned by Jim’s aunt and uncle was always our favorite; hands down. The farm was located about thirty miles outside of Rockford, Illinois along the Pecatonica River. For many years we visited the farm several times a year during the fall and winter, chasing cottontails and those wily ring neck pheasants. Jim’s Aunt and Uncle were a hoot. His aunt, the typical bustling farm woman, directed the pace of operations for her rather laid back husband. 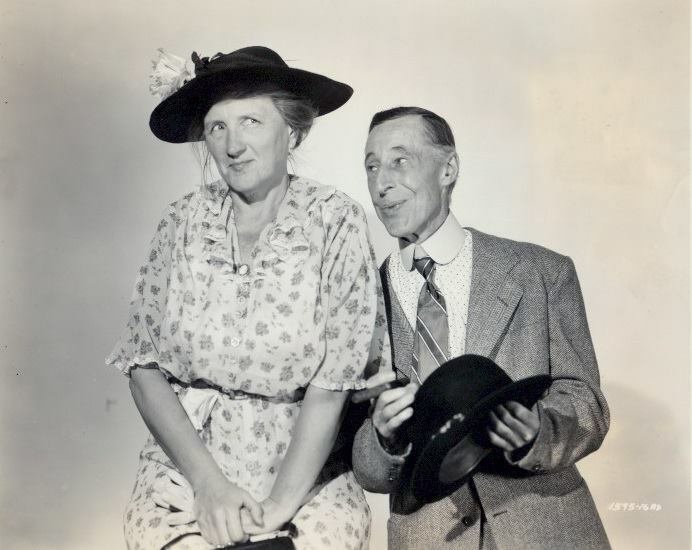 They were very much like Ma and Pa Kettle of the old film series starring Marjorie Main and Percy Kilbride… and that’s how we always referred to them. The farm consisted of about four hundred acres of corn and soybeans, along with a dozen or so dairy cattle, several beef cattle plus numerous chickens and ducks. We would usually spend two or three days there during our visit; helping out with farm chores in exchange for room, board and hunting privileges. Our rooms were on the second floor of Ma and Pa’s ancient farm house. The heat source up there was a grated hole in the ceiling which allowed warm air from the first floor to migrate to the second floor. On cold winter nights you could see your breath up there and we often slept wearing every article of clothing we had with us. Mornings consisted of a large farm breakfast including fresh chicken or duck eggs, thick bacon and homemade biscuits. As we arrived downstairs for breakfast, Pa would be coming in from the barn or field, having already been up a couple of hours tending to farm chores. After breakfast we’d hang around in the hot kitchen still trying to warm up a bit; then we’d gather our gear and head out for the first hunt of the day. We always started out in the barn. Wild pigeons roosted in the upper loft, feeding on Pa’s grain and making a mess. Pa encouraged us to shoot as many of them as we could. Our strategy here was to have one guy inside the barn that would raise hell, causing the pigeons to flush out of the very upper barn window. The second guy would be out there shooting at the birds as they flew out. Now that may sound easy, but those pigeons flew out of there like they were shot out of a cannon, and whenever we hit any it was mostly pure luck. One day Jim and I hatched a plan to outsmart the pigeons; we both raised Caine inside the barn and tried to shoot them BEFORE they flew out. In our “exuberance” we managed to hit the roof several times aerating it for extra ventilation and future rain showers. Pa Kettle, being Pa Kettle, didn’t raise his voice or lose his temper. He just made us go up on the barn roof with him for the necessary repairs. Pa had a ladder that would make a fireman green with envy, easily reaching the edge of the barn roof. Now up there, Jim and I clung to the ladder in terror, hanging on like the plane was going down. Our obvious discomfort fairly amused Pa who chuckled happily while he patched up the roof. Needless to say we never implemented that shooting strategy again. After we addressed the pigeon problem, we would tackle another source of irritation for Pa. The corn cribs and grain silos near the barn were plagued by rabbits that would feed all night on Pa’s grain and then rest during the day nearby. Keeping in mind our morning of terror on the barn roof; we loaded our shotguns with number 8 shot to avoid any damage to the silos and cribs. After popping a few bunnies, we would drop them off with Ma who would let out a cackle and throw them into her porch storage bin. Later in the day she would clean them and at some point in the future they would be on the menu. Having put the pigeons and rabbits on notice, we now got down to the business of what we came for….pheasant hunting. Pa’s farm and the adjacent area was home to a nice population of wild ring necks who were fat, colorful and cagy. Normally hunting pheasants without a dog is an effort in futility, however with so many birds in and around the farm we were always able to flush plenty of them ourselves. We’d walk to the end of the farm and work a hedgerow next to a corn or soybean field. The birds would run along ahead, but one of us would be positioned at the end of the hedgerow, while the other would walk through the hedgerow pushing the birds along. Both of us would usually get plenty of shooting when the surprised birds flushed at the end of said hedgerow. We’d work each hedgerow on the farm throughout the day. During the years we hunted Ma and Pa Kettle’s farm, private property in Illinois had no wild game limit so we could take as many as we wanted. Usually in early afternoon we’d break for lunch and a short nap. Ma would always have a great spread for us, and knowing that Ma always put on that great feast, Pa made sure he came in from his chores at the same time and joined us. After a short siesta we would often go visit Jim’s cousin who lived nearby with his young family. His cousin worked for American Breeders Society and artificially inseminated cattle for local farmers. This occupation fascinated Jim and I and we would accompany him on his rounds. While on his rounds he would provide plenty of jokes relating to his occupation along with a number of humorous stories regarding trysts with cows that had gone bad. He showed us how he cautiously approached the “promising” Heifer in waiting, and how he stood with his legs slightly bent so when the inevitable kicks came, his legs wouldn’t get broken. He offered to let both of us have a crack at the task, however with discretion being the better part of valor, we turned him down. 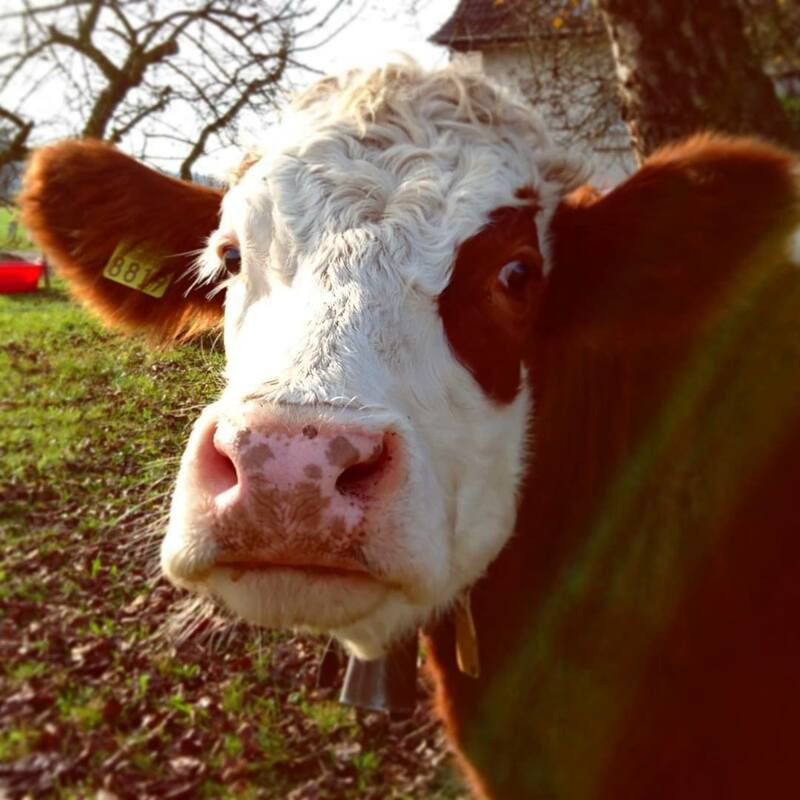 The thought of possible rejection by a young bovine in heat left us hesitant to tackle the job. Or worse yet; the fear of an over-zealous love struck six hundred pound cow mauling us in a barn was more than our pride (and bodies) could probably stand. Jim’s cousin was also a trapper and after his cattle breeding chores were done we’d accompany him working his trap-line along the Pecatonica River. Jim and I proved to be no better at trapping than we were at breeding love sick bovines, but we enjoyed watching his cousin deftly handle that pursuit as well. One thing we learned regarding farmers; they hold to a schedule. Having learned that early on, we made sure we were back on the farm in time for Ma Kettle’s supper; which was even better than her fantastic lunches. After supper Jim and I would head to an area where we knew the pheasants came in to roost for the night. We would usually get plenty of shooting in and would hunt until dusk. At the end of each visit we’d coax Ma and Pa into letting us take them out to the local supper club. The two of us being poor farmhands, and worse carpenters, outside of leaving Ma and Pa with some rabbits and pheasants, had no other way to repay them for their hospitality. 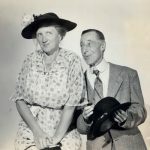 Pa Kettle was all for it and enjoyed an evening out immensely, but the ever practical Ma Kettle fussed about it like she was going for a root canal. “Can’t see spending good money on a little dinner that we can make at home” she’d mutter. We’d usually bring some wine with us and if we got her to drink a few glasses before supper, we could soften her up for the outing. Once out she fretted about her appearance and the cost we would incur, but enjoyed herself in spite of her own objections. The next morning, after another great breakfast, a box of homemade preserves would be handed to us and we’d be sent on our way; concluding another fine visit with Ma and Pa Kettle! Great blogs, Joe. I reposted one of your blog so my family and friend can read your adventure with James. Congratulations and wishing you more success! Thank you Tess; very glad you enjoy my stories. You are more than welcome to share them.